Bogar Alonso is a mosaic writer and creator. He runs editorial at the innovation and trends publication PSFK and has had his films premiere and nab awards at international film festivals. 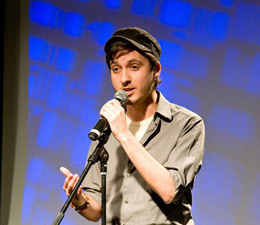 His editorial and journalistic work has been published on Vice, Gawker, and The Huffington Post, and he has been the finalist for emerging artist competitions in the poetry and TV worlds. 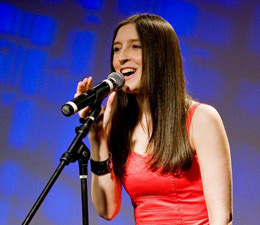 Tara Bracco is the founder of Poetic People Power. She has been featured in O, The Oprah Magazine, Time Out New York, The Huffington Post, and MSNBC.com. Her non-fiction writing has appeared in Cosmopolitan, American Theatre, BUST, Clamor, and Brooklyn Rail. 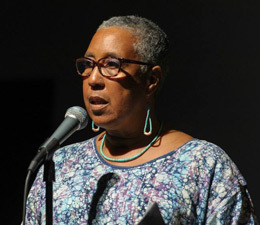 She has performed her poetry and spoken about art and social change at colleges, festivals, theatres, and poetry venues. Tara has received awards from the Puffin Foundation and Left Tilt Fund. She also co-founded and serves on the Board of international nonprofit The Project Solution. 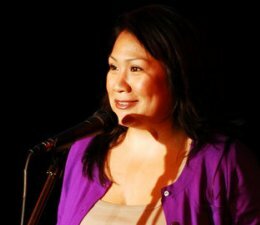 Erica R. DeLaRosa is a performer, director, activist, and educator. She is a co-founder of Mahina Movement, a performance trinity and production company. Erica has shared stages with Sonia Sanchez, Suheir Hammad, and Dead Prez. She has directed several productions and facilitated numerous artistic workshops in the New York and Texas areas. 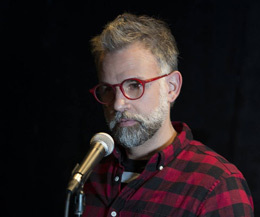 Andy Emeritz has been performing as both a poet and musician since 1995. His writing has appeared in The Good Apple Literary Magazine and on nerve.com. He has performed as a musician in venues throughout New York City. Andy has spent a fair amount of time in Russia, and has performed at festivals and orphanages throughout Moscow, St. Petersburg, Yaroslavl, Samara, Kazan, and a few other small towns in the countryside. He holds a BA in Political Theory from Cornell University, where he studied poetry and narrative writing under James Farrell and Dan McCall. Nicole Goodwin was the recipient of City College's The Riggs Gold Medal Essay Award for 2011, a finalist for the Poets House's 2013 Residency, and a fellow of the North Country Institute and Retreat for Writers of Color. She is the former editor of Escriba/Write, winner of the 2006 CCHA Eastern Region Small Journal Award. A single mother, she earned her Bachelors of Arts in English and Anthropology from City College of New York. Karla Jackson-Brewer is an educator, an optimist, an integrative therapist, an Emotional Intelligence Coach, and a teacher of numerous spiritual traditions. An activist for social change in the anti-violence movement, she has spoken out against racial, gender and class inequality all her life. Her work has been published in Ikon Magazine, Women of Power Magazine, and Skin Deep: Women Writing on Color, Culture and Identity. 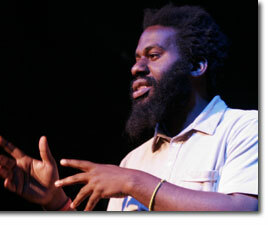 Sugar Johnson hails from Crown Heights, Brooklyn and currently lives in Atlanta where he works as a Math teacher. The burgeoning writer, actor, and vocalist has shared the stage with a unique array of prolific artists including Bob Holman, Jessica Care Moore, Ilu Aye, Nathan Zoob, and Spike Lee. He enjoys mixing art and education, and he traded a position in the corporate sector for teaching poetry in New York City public schools. 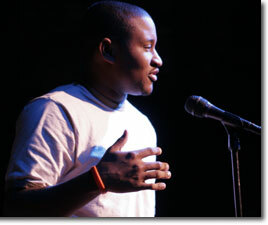 He most recently produced and performed in a series of one man shows in Georgia under the "Sugar Johnson Presents..." moniker. Angela Kariotis is the author and performer of several one-woman shows including Stretch Marks, Reminiscence of the Ghetto & Other Things That Raized Me and Say Logos Say Word. She is the recipient of several awards including the NJSCA’s Playwriting Fellowship, the Tennessee Williams Theatre Fellowship and the National Performance Network Creation Fund Award. 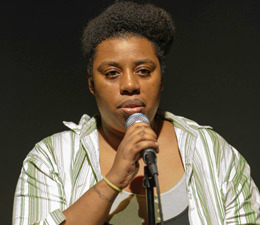 Her work has been presented by venues such as UCLA-Live, The Hip Hop Theatre Festival in New York City, and Contact Theatre, Manchester, UK. Visit www.angelakariotis.com. Shane Michael Manieri is a poet whose work has appeared in Lambda Literary Review, Painted Bride Quarterly, and Word For Food press. He has taught writing at Columbia University and worked with ESL students in Brooklyn. He helped created the Buddhist outreach group QueerDharma, which raised funds for a LGBT shelter, and has volunteered as a Big Brother for Incarnation Children's Centre. 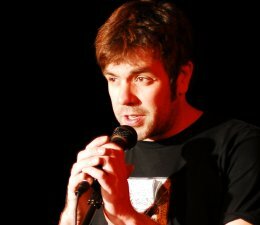 He holds an MFA from Columbia University and received a full-immersion language grant from Italian Cultural Institute. Vaimoana Niumeitolu is an artist and educator. 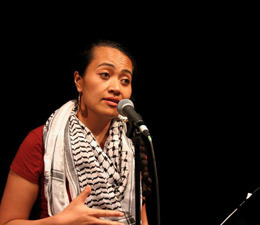 Born in Tonga, she is a founding member of Mahina Movement, the all women trio that has performed on over 500 stages including with Angela Davis, Harry Belafonte, and Noam Chomsky. Moana has shared her poetry and paintings all over the U.S. and in Fiji, Tonga, Ireland, and South Africa. Her one woman show Tongue-in Paint was presented at Performance Space 122, and her show A Prayer for Tonga premiered at Harvard University. 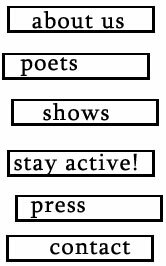 Scottt Raven is a touring spoken word poet with the Mayhem Poets performing extensively from prisons to playgrounds and in schools, colleges, theaters, and conferences around the world (FIAT, Today Show, New Victory Theater). Most recently he authored Sconnettts, a collection of Shakespearean Sonnets based on his romantic relationships, favorite shows, and action movie heroes. He's also the creator of Milkshakespeare, a new series centered around an obsessive poet, really good ice-cream, and the Bard. 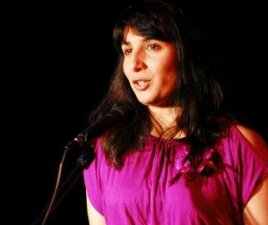 Shetal Shah is an actor, performance poet, filmmaker, and climate change activist. Favorite film, TV, and theatre credits include Arya (2005 SAMA, Best Actress), Loins of Punjab Presents, Butterfly Screams, The Daily Show, VH1 Denmark and Truth Be Told. 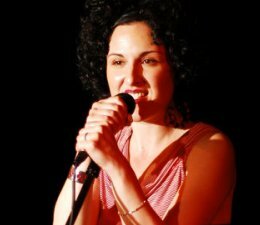 Shetal was an invited poet for Lincoln Center’s La Casita Festival and has performed her poetry throughout NYC including at the Bowery Poetry Club and the Nuyorican Poets Cafe. Shetal actively engages in water and climate change issues at the global level and is currently using the creative film approach to address these issues. 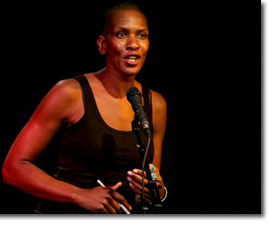 Pamela Sneed is a New York based poet, performer, writer, and actress. She has been featured in The New York Times Magazine, The New Yorker, The Source, and Time Out. Her first book, Imagine Being More Afraid of Freedom Than Slavery, was published by Henry Holt and her forthcoming manuscript is America Ain’t Ready. She has performed original works for sold out houses at Lincoln Center, The Studio Museum, PS 122, and she headlined the 2005 "New Work Now Festival" at Joe's Pub for sold houses. Natalia Vargas-Caba is a graduate of Sarah Lawrence College in Creative Writing and Spanish. Her work has been featured in No, Dear magazine and Babbling of the Irrational. She is a publicity assistant for Atria Books and lives in the Bronx. Jonathan Walton has published three books of poetry: My Release, The Second Verse, and Legal: The First 21 Years. He has taught creative writing workshops at all levels including work with the National Foundation for the Advancement of Arts and the Department of Juvenile Justice. A graduate of Columbia University, he is the NYC Urban Project Director for InterVarsity. A sponsored artist for World Vision, Jonathan aims to bring holistic social justice to the forefront of America's consciousness. More info at www.nycurbanproject.com. 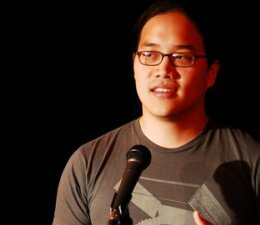 Justin Woo is a poet, theatre artist, and DJ. 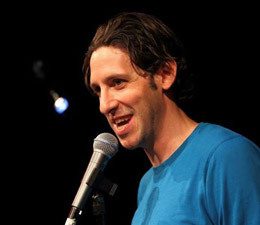 He has performed at universities and theatres in New York, New Jersey, Connecticut, and D.C., including the 2007 NYC Fringe Festival and the Tony Award-winning Crossroads Theatre. He has collaboratively created several multidisciplinary spoken word theatre pieces, and is currently working with Insurgo Stage Project and the Spoken Word Almanac Project to create two new shows. Show photos by DiMartino Photography, Leah Rae Photography, Mark Rywelski, Frederick V. Nielsen II, Chris Grace, and Ashley Faison. © 2018 Poetic People Power. All rights reserved.